DNS (Domain Name System) is a naming system that maps a server's domain name, like example.com, to an IP address, like 203.0.113.1. This is what allows you to direct a domain name to the web server hosting that domain's content, for example. To set up a domain name, you need to purchase a domain name from a domain name registrar and then set up DNS records for it. Registrars are organizations that have completed an accreditation process that allows them to sell domain names. Registrars typically offer services to manage DNS records as well, but once you have purchases a domain, most registrars will allow you to manage your DNS records with other providers. 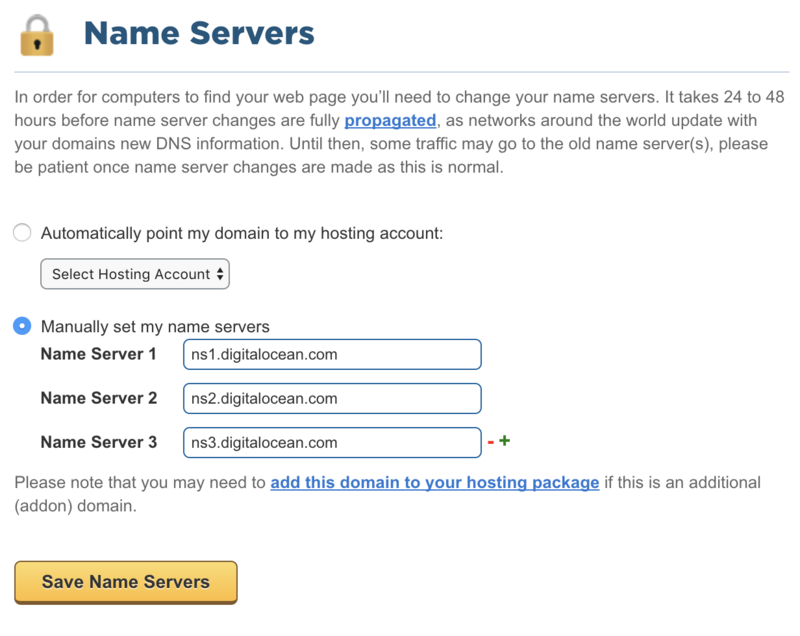 DigitalOcean is not a domain name registrar, but you can manage your DNS records from the DigitalOcean Control Panel. 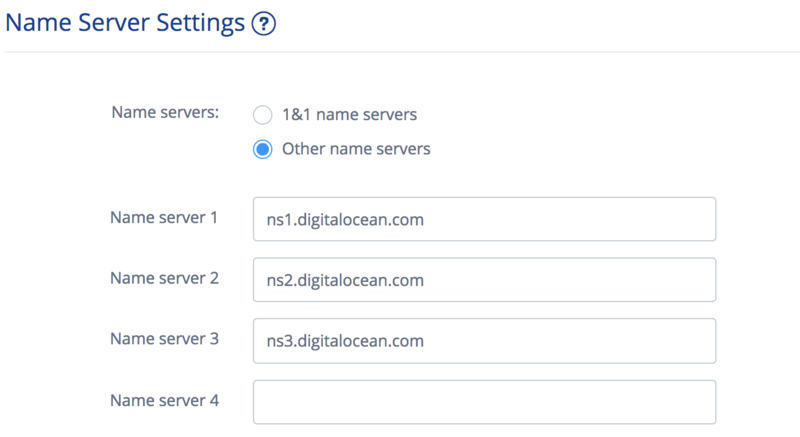 This can make record management easier because DigitalOcean DNS integrates with Droplets and Load Balancers. To follow along with this tutorial, you will need a domain name that you own or control. To change the nameservers, you'll need to log into the domain registrar's account management section. Once you're logged in, follow the directions for your registrar below. 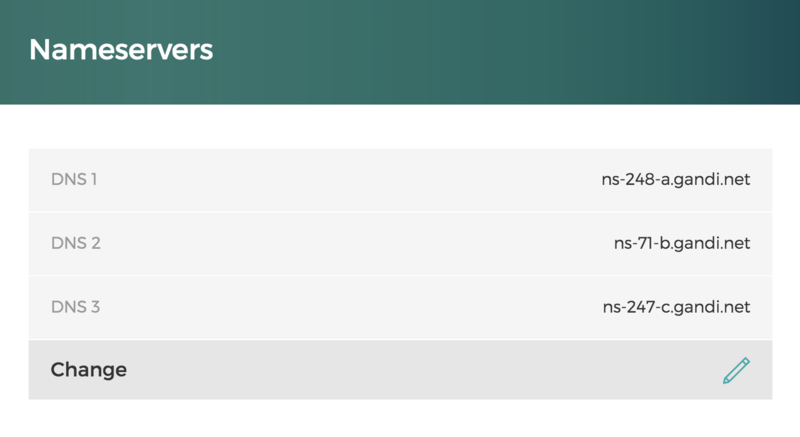 If your registrar is not included, check their documentation for changing nameservers. 1. Sign in to your GoDaddy account. 2. On your account homepage, click the DNS tab on the right-hand side of the Domains main page. It will be located in between the Add Privacy and Manage tabs. 3. On the next screen, navigate to the section of the page that reads Nameservers. Click Change. Note that you will have to click Add Nameserver to add the last entry. Click Save to apply your changes. 5. Now you are ready to move on to connecting the domain with your Droplet in the DigitalOcean control panel. Check out the Conclusion section at the end of this article to find out about what to do next. 1. Sign into your HostGator account. 2. Click on the domain name that you want to use with your Droplet. 3. You will then be presented with a Domain Overview. Click on Change under Name Servers. Note that you will have to click the green + symbol to add the third name server. 5. Click Save Name Servers to apply your changes. Now you are ready to move on to connecting the domain with your Droplet in the DigitalOcean control panel. Check out the Conclusion section at the end of this article to read about what to do next. 1. Sign in to your Namecheap account, then click Domain List in the left-hand column. You will be presented with a dashboard listing all of your domains. Click the Manage button of the domain you'd like to update. 3. Click the green checkmark to apply your changes. Now you are ready to move on to connecting the domain with your Droplet in the DigitalOcean control panel. Check out the Conclusion section at the end of this article to read on what to do next. 1. Sign in to your 1&1 account and go to Domains tab on the left side of your homepage. 2. Once on the Domains landing page, click on your domain name. 3. On the next page, click on Modify DNS Settings. 5. Scroll down to the bottom of the page and click Save to apply your changes. Now you are ready to move on to connecting the domain with your Droplet in the DigitalOcean control panel. Check out the Conclusion section at the end of this article to read about what to do next. 1. Sign in to your Name.com account. 2. Click on the My Account icon, and select My Dashboard from the dropdown menu. 3. On the Dashboard screen, click on your domain name. 4. On the your domain’s home screen, click on Nameservers, on the left side of your screen. You will be asked to update each change individually, and to Apply Changes once you are finished with your edits. Be sure to also delete the fourth default nameserver from the list. 6. Now you are ready to move on to connecting the domain with your Droplet in the DigitalOcean control panel. Check out the Conclusion section at the end of this article to read about what to do next. 1. Sign in to your Network Solutions account. 2. Select My Domain Names. 3. Find the domain name that you want to use with your Droplet, then select Change Where Domain Points. 4. 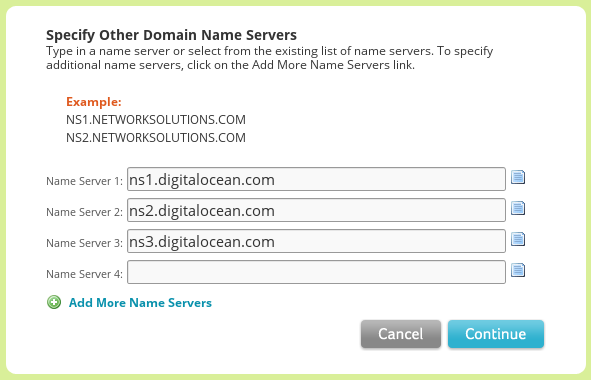 Select Domain Name Server (DNS), then select Continue. 6. Select Continue, then confirm your changes on the next page by selecting Apply Changes. Now you are ready to move on to connecting the domain with your Droplet in the DigitalOcean control panel. Check out the Conclusion section at the end of this article to read about what to do next. 1. Sign in to your eNom account. 2. Under Domains, select Registered Domains. If you have multiple domains registered with eNom, select the domain name that you want to use with your Droplet. 3. Select DNS Server Settings. 4. Under User our Name Servers?, select Custom. 6. Select save, then confirm your changes in the popup by selecting OK. Now you are ready to move on to connecting the domain with your Droplet in the DigitalOcean control panel. Check out the Conclusion section at the end of this article to read about what to do next. 1. Sign in to your Gandi account. 2. Navigate to Domains on the left side of your dashboard. 3. Click on the domain you would like to use with your Droplet. 4. Select Nameservers from the menu on the left of your screen. 5. Click on the pen icon under the Change heading at the bottom of the Nameservers screen. 7. Click Save. Now you are ready to move on to connecting the domain with your Droplet in the DigitalOcean control panel. Check out the Conclusion section at the end of this article to read about what to do next. 1. Sign in to your Register.com account. 2. Under the Account Dashboard, select Domains and then Manage from the list of available options. 3. Click Manage under Manage Product for the domain name you want to associate with your Droplet. 5. Select Continue, then confirm your changes on the next page by selecting Continue. Now you are ready to move on to connecting the domain with your Droplet in the DigitalOcean control panel. Check out the Conclusion section at the end of this article to read about what to do next. 1. Sign in to your A Small Orange account and select My Domains. 2. Find the domain name that you want to use with your Droplet, then select Manage Domain to the right of that domain name. 3. By default, A Small Orange locks your domain to prevent it from being transferred away without your authorization. This means that before we can change the nameservers, we'll need to disable this lock. Select the Registrar Lock tab, then select Disable Registrar Lock. 4. Select the Nameservers tab. 6. 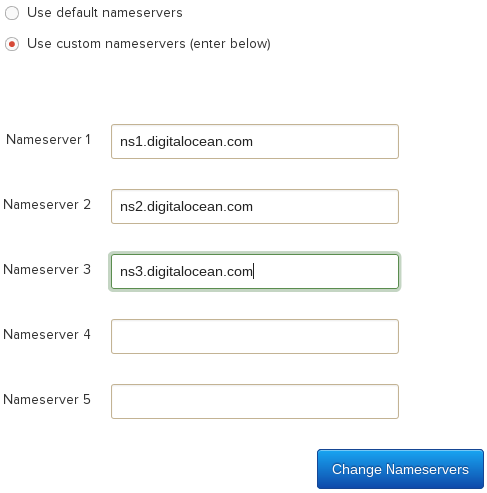 Select Change Nameservers to apply your changes. Now you are ready to move on to connecting the domain with your Droplet in the DigitalOcean control panel. Check out the Conclusion section at the end of this article to read on what to do next. 1. 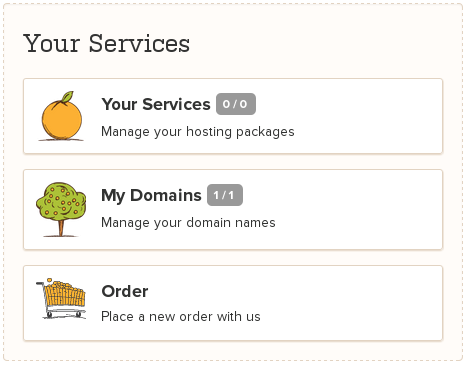 Sign in to your iwantmyname account and select the Domains tab. 2. Select the domain name that you want to use with your Droplet. 3. Under Nameservers, select update nameservers. 4. 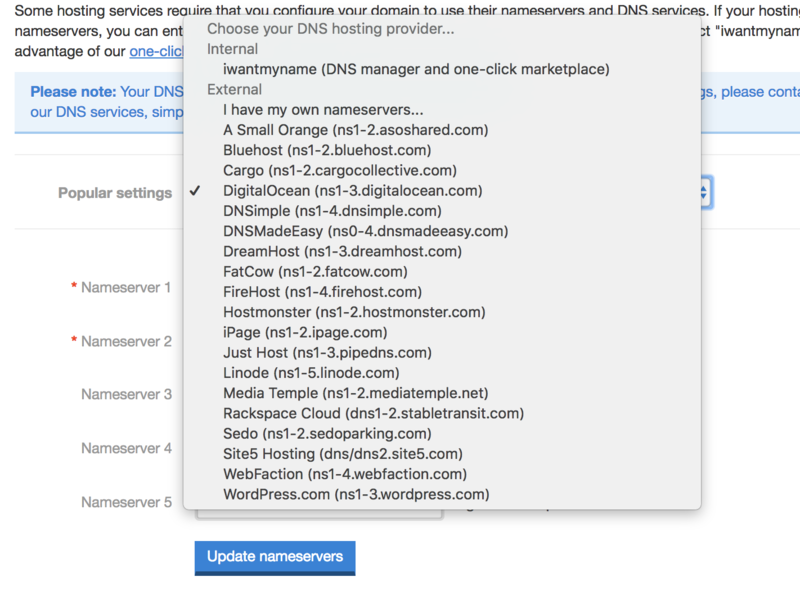 Unlike many other domain registrars, iwantmyname features a menu of popular web hosts with preconfigured DNS settings. 5. 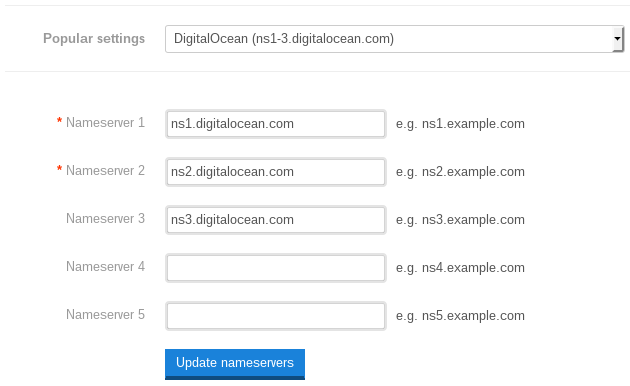 Choose DigitalOcean (ns1-3.digitalocean.com) from the dropdown menu, and the fields below will be automatically filled in with the correct settings. 6. Select Update nameservers to apply your changes. 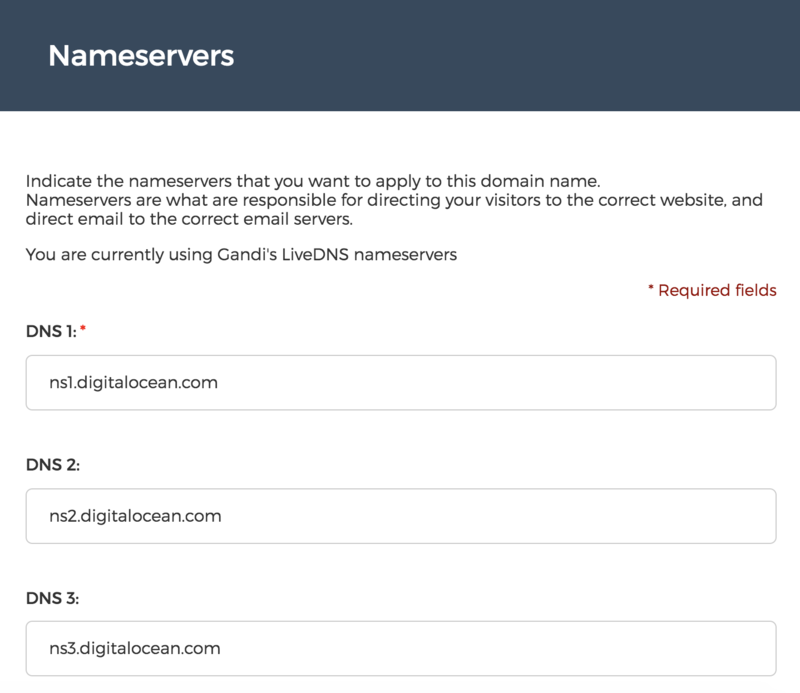 Now you are ready to move on to connecting the domain with your Droplet in the DigitalOcean control panel. Check out the Conclusion section at the end of this article to read about what to do next. 1. 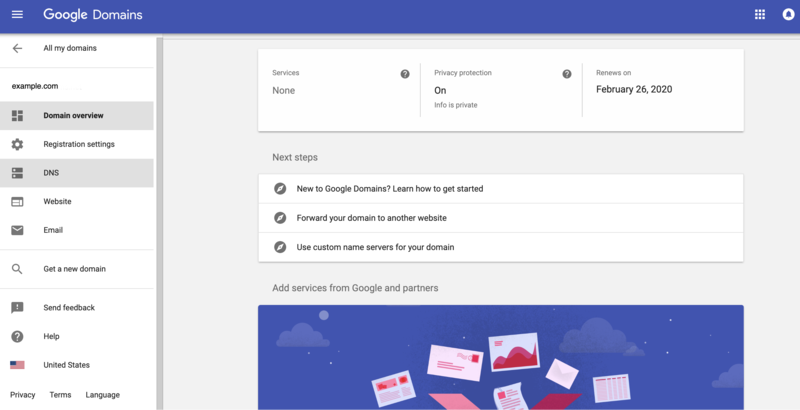 Sign in to your Google Domains account. 3. On the lefthand navbar, click on DNS. 4. Click on Use custom name servers. Note: You'll need to hit the + to the right of the nameserver field to make more fields visible. 6. Select Save to apply your changes. Now you are ready to move on to connecting the domain with your Droplet in the DigitalOcean control panel. Check out the Conclusion section below to read about what to do next. You can enter these nameservers into the appropriate fields when prompted, following the examples outlined in the previous sections. It will take some time for the name server changes to propagate after you've saved them. During this time, the domain registrar communicates the changes you've made with your ISP (Internet Service Provider). In turn, your ISP caches the new nameservers to ensure quick site connections. This process usually takes about 30 minutes, but could take up to a few hours depending on your registrar and your ISP's communication methods.